The last week or two I have been hanging out on my balcony for a little while almost every day. Mostly I will drink some tea and do a bit of stretching while I listen and watch the birds. I thought it might be fun to start posting about some of the birds I encounter. 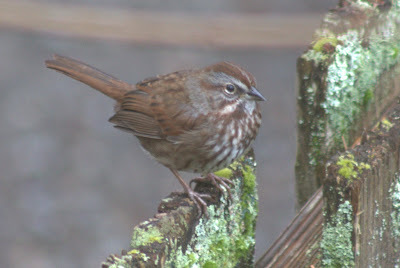 This one is Sam the song sparrow (Melospiza melodia). He is a little shy, but most of the time I can see him hanging out on the ivy hedge bordering the yard next to ours. He is the only bird so far that I recognize as an individual (not that I could pick him out of a line up, but based on his consistent location and behavior). Fairly often he will get a bit sneaky and come over to the bird feeder in our yard. He likes to fly under the porch next to the feeder first, then hop out to where the food is. Sam has been singing from his perch since before I started doing these sits. Recently I started to wonder if he would get a girlfriend soon. This morning when I started photographing him I noticed another song sparrow on the hedge a foot or two away. She would sit there quietly while Sam sang, or sometimes would hop down to feed on the ground while Sam perched on a shrub nearby. It will be interesting to keep an eye on them as the season progresses. 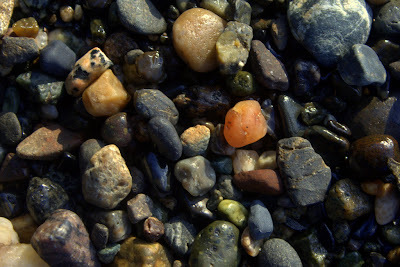 I don't tend to spend a lot of time look at pebbles. But these ones from up near Bellingham sure were pretty. I'm curious about all the different colors and textures. Most of the larger rocks I see are fairly uniform, why does this stretch of beach have such a high degree of variation?